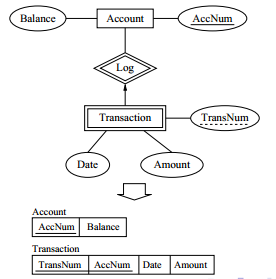 The entity-relationship model described in the previous lecture is a diagram. The main purpose is to clearly picture the constraints of the database to someone that is not necessarily coming from a computer science field. USE: specifies the database you wish to work with. If you are currently working in the sales database and wish to add something related to the employees db you’ll switch databases by issuing the USE employees command. The last DDL that we’ll cover is the DROP operation: it removes the entire database objects from the Database System. SELECT : used for retrieving rows from a table (most used command in SQL. UPDATE: modifies data of one or more records. 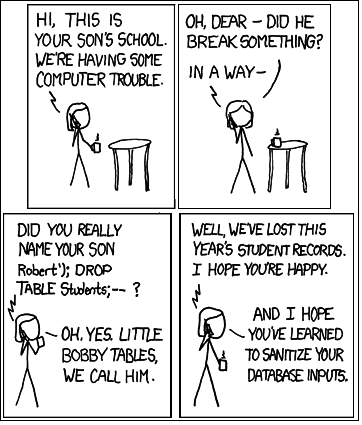 INSERT : adds one or more records to a database table. DELETE: removes one or more records from a table depending on conditions passed as a parameter. Accessibility in terms of querying time is one of the main advantages of using the relational model. The most common tool for it is SQL : Structured Query Language. It covers both defining relations (DDL) and writing/querying data (DML). DECIMAL(n,d) : value of n digits with decimal point d positions from right. user defined domains: explicit conversions are required for those. A good way to remember this is the Mars Climate Orbiter, who crashed due to an error for mixing imperial and metric units without conversion. We’ve already discussed constraints in the previous lecture. An integrity constraint ensures that changes made by authorized users do not result in a loss of data consistency. The designer specifies them when the DB is created and the DBMS checks if the condition is true when relations are modified. The domain definition is an example of integrity constraint. A candidate key is a set of columns allowing us to distinguish rows. It can uniquely identify a record without mentioning any other data. The attribute “First Name” won’t identify any record in a database of students. In this database, you can have Dan Crisan, but also Dan Smith. To make sure that you have the required row, the required student, you will also have to take a look at the “Last Name”. Hence, the combination “First name” + “Last name” is a candidate key. In a banking database, the combination of the customer’s ID and a sequential number for each of his bank accounts is a valid candidate key. Also, the ISBN (product number) is a valid candidate key. The ISBN number is also an example of a primary key: a column or a combination of columns that uniquely identify a record. Only one Candidate Key can be a Primary Key. In addition of candidate keys and primary key, databases also have foreign keys: they refer to a primary key in another table. It’s a key to define the relationships between tables. Say we have a StudentEvent table where the primary key is the EventID. The personInCharge is actually storing studentID… which is the foreign key to the Student table. It defines the relationship between Student table and StudentEvent table. 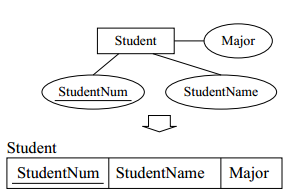 Another example is where in database Enrolled, studentID is a foreign key referring to database Students. This can illustrate the concept of referential integrity: when one table has a foreign key to another table, the concept of referential integrity states that you can’t add a record to the table that contains the foreign key unless there is a corresponding record in the linked table. In this example, we can not add a student to the database Enrolled if the database Students doesn’t contain this student. Referential integrity is achieved if we don’t have this inconsistency. we can’t add a record to the Employees table unless the managedBy attribute points to a valid record in the Managers table. if the primary key in the Managers table changes, all affected records in the Employees table must be modified using a cascading update. if a record in the Managers table is deleted, all affected records in the Employees table must be deleted using a cascading delete. 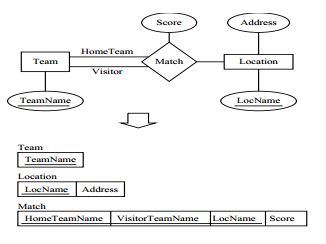 Now what are the steps to go from an entity-relationship model to the relational model? Entity set E with attributes a1, …, an translates to table E with attributes a1, …, an. The primary key of the entity set is the primary key of a table. The entity set Student has attributes Major, StudentName and primary key StudID. If we declare A ISA B, every A entity is also considered to be a B entity. As a general approach, A has the attributes of B + its own attributes. *Remember that aggregation is a summary of our database: hence, we will have the primary key of each database and the descriptive attribute of the relationship between the relations (in this example : ssn, did, pid AND until). Key constraint is just a fancy word of saying that we have Foreign keys, dependencies between tables. We just need to map the relationship to a table. Another way of doing it is combining the dominating entity set with the relationship. What doesn’t change? We still keep the primary key of the dominating entity set. What does change? Since we combined the dominating entity set and the relationship, the new table now also contains the attributes of the dominating entity (Departments) AND just one foreign key: the one referencing the remaining entity set (in our case, Employees). If there is a participation constraint (every manager has a department), we highlight this in the table by adding a NOT NULL option to the parameter related to a mandatory participation. In our case, since department has a depID, every manager should be related to a department, hence his socialSecNum is mandatory associated to the depID. As an example, if we have 2 related databases Enrolled and Students, deleting the studID from one table will also delete the studID from the other table, if we mention ON DELETE CASCADE. This is done in order to preserve data consistency (referential integrity). 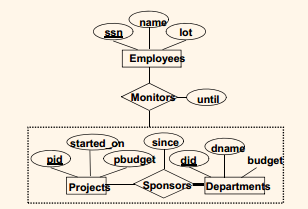 SQL implements the relational model, translated from the entity-relationship model.